Contaminated groundwater goes unnoticed by many people, but its effects are damaging. Contaminated groundwater can be a result of chemical spills, improperly maintained factories, or human negligence. Its effects are damaging to the environment and those who depend on it for survival; toxins in groundwater can harm wildlife, hurt people, and make land unusable. But there are several methods available for both containing and treating contaminated groundwater to restore an affected area. The most straightforward way to handle contaminated groundwater is to wall it off. This has been the purpose of slurry walls for decades, according to the Indiana Depart of Environmental Management. Slurry walls work by blocking contaminated groundwater. A more flexible form of groundwater walls are permeable reactive barriers (PRBs). These let some water through, but help to decontaminate it. According to the EPA, workers install these walls by digging a trench, then dropping in materials for the wall. Most semi-permeable barriers are made of materials, which work to decontaminate groundwater, as well as solidifiers like sand and concrete, which affect the barrier’s permeability and help it to hold its form. Slurry walls and PRBs offer a number of benefits: they’re relatively cheap and need very little ongoing maintenance or oversight once they’re in the ground. The surface above and around them can often go back to its original use once construction is complete. Additionally, these walls can be constructed with varying degrees of permeability, depending on the project’s needs. Grout, which has characteristics of mortar and concrete, can be used to effectively contain or divert groundwater. Basically, workers pump grout into holes in order to make the soil more impermeable and shore up potential weaknesses. For instance, grouting was used at the Red Rock Dam in an attempt to control underseepage and reduce the permeability of a limestone table. One variation is called jet grouting, in which soil and grout are mixed together and injected as a seamless barrier. This technique has been used for containing radioactive waste, per the American Society of Civil Engineers. Grout pumping is popular for a few reasons. It can (and usually should) be mixed on-site, allowing for versatile, evolving mixtures that can react to what a project requires. Additionally, grout pumping can occur relatively close to structures without disturbing them. 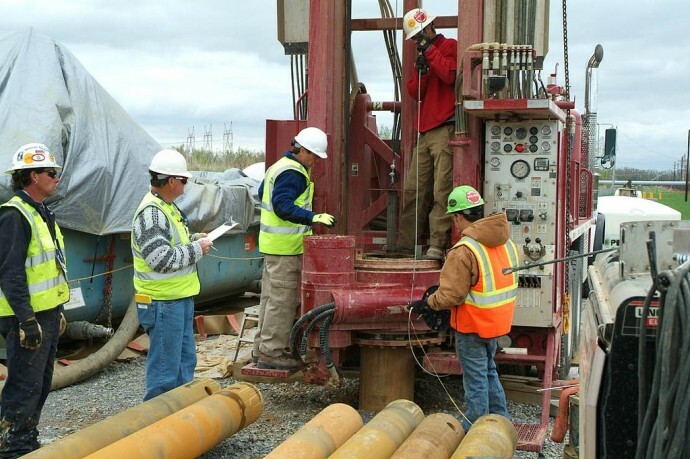 A more complicated way to deal with contaminated groundwater is pump and treat. The EPA describes this method as a three-part process: contaminated groundwater is pumped up to an above-ground treatment station; the water is decontaminated; and finally, the now-clean water gets pumped back into the ground or to another location for disbursement or further treatment. Pump and treat is used at more sites than any other treatment method, according to the EPA. Its effectiveness has been shown in numerous cases. One example is the Baird & McGuire chemical plant, which produced a huge amount of contaminated soil and water until its closure in 1982. Though there is work left to be done, years of pump-and-treat tactics have helped to stabilize the site. Depending on the circumstances, barriers, grout pumping, or extraction techniques (such as pump and treat) might be necessary. They’re often used in conjunction with one another. Constructing a facility with one or more of these measures in the planning stages could be an effective way to head off contamination problems before they happen. Lonnie Brandon is a freelance writer based in Salem, Oregon. For additional information on how to contain contaminated groundwater Lonnie recommends that readers visit geo-solutions.com. Image credit goes to United States Government Work.